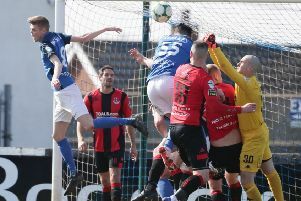 The Lurgan Blues' goalkeeper, Jonny Tuffey, produced a number of fine stops but conceded to the Crues' Jordan Owens early in the second half. Jonny Tuffey produced a number of strong saves to help Glenavon defeat Crusaders. However, player/manager Gary Hamilton came off the bench to set up Stephen Murray for the equaliser before delivering a corner-kick which led to handball and a decisive injury-time Sammy Clingan penalty.